This 130-page book (with illustrations) takes the form of a course with exercises. As you read each chapter you will build and configure your own multiboot USB drive. In many cases you just need to copy over the ISO file to E2B USB drive and it is ready to use. Using your USB drive, you will be able to directly boot from 100's of different linux ISOs (many support persistence), boot to different Windows Install ISOs, boot from floppy disk image files, boot to multiple WindowsToGo OS's, install Windows+apps+drivers without any user interaction and much much more! It contains lots of information, hints and tips about booting from USB drives and information about some common BIOS bugs which you may encounter and how to avoid them. As well as standard IBM-compatible Legacy BIOS booting, you will also learn how to UEFI-boot from multiple payloads (including Secure UEFI booting from multiple payloads). 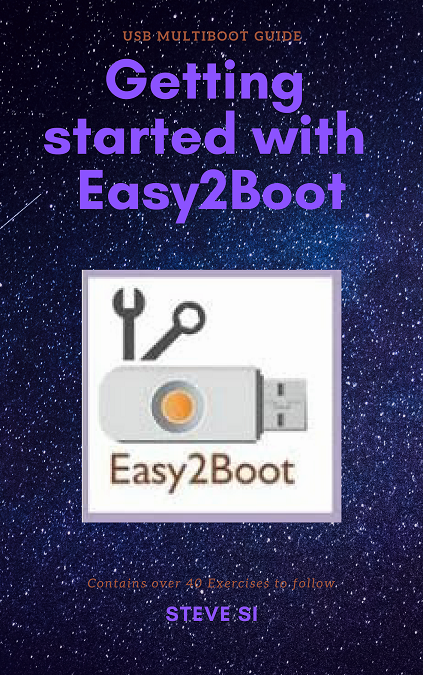 Easy2Boot supports over 300 different types of bootable payloads and it has been developed to work reliably on a wide range of computers. There are over 40 Exercises: DOS games, HDDGuru, AVG Rescue, Dr. Web CureIt Live CD, Hirens 15.2, gparted, Q4OS, AOSS, Eset AV, Strelec MiniWindows, Ubuntu, Cub linux, Puppy linux, Windows 10 install, MemTest86, CloneZilla, Paul Vreeland's AIO-SRT, Bob Omb's WinPE, DLC Boot, Windows 10 install with UEFI, Gandalf's WinPE + PortableApps, Porteus, Windows XP install and WindowsToGo, configuring E2B, add a DNA animation to the menu, fully automated install from a Windows 10 ISO with apps and drivers using SDI_CHOCO.